Latest news is that State Bank of India has made link active of SBI PO Admit Card for Main Exam 2015. The SBI PO Main Exam 2015 for phase II has scheduled to be held on 26th July 2015. 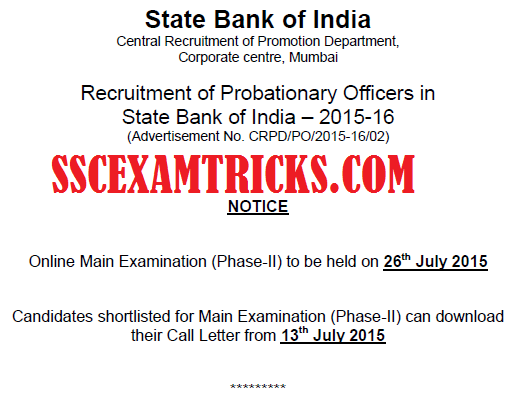 SBI had conducted Phase I Pre-exam 2015 for Probationary Officer (PO) in June 2015. SBI PO Pre-exam Result 2015 has declared on 09th July 2015 on official website www.sbi.co.in. The qualified candidates are called for SBI PO Main Exam 2015. Those candidates who had scored / marks obtained in pre-exam more than cut off marks, they will appear in SBI PO Main Examination. The admit card link has available now (10.07.2015) and can downloaded from the direct link given on the page. A huge numbers of candidates will be appeared in HTET 2015. These candidates need HTET Admit card / Hall ticket for appearing in examination. These candidates can download HTET Admit Card from direct link given here. Remember that no candidate will be allowed to appear in SBI PO Main Examination without main exam admit card / hall ticket. The main exam admit card / hall ticket will be valid you’re your photo identity proof. You are suggested that do not bring any extra material except SBI PO Main Exam 2015 Admit Card. The SBI PO Main Exam 2015 Hall Ticket shall be attested with coloured photograph and Gusseted Officer. You can bring photo identity proof such as Voter Card ID or PAN Card ID and blue / black ball point pen in the SBI PO Main Examination 2015. You are not allowed to bring mobile phones or any other electronic gadgets at the venue of SBI PO Main Exam. Otherwise you will be restricted at the entry gate of the SBI PO Main examination 2015. You will be checked thoroughly before getting entry to SBI PO Main Examination Hall. Don’t forget SBI Main Exam admit card, photo identity proof and pen before leaving for SBI PO Main Examination. SBI PO Main 2015 Exam Pattern: SBI PO Main Examination will be multiple choice question paper containing 200 questions in it. In this main examination, five options will be given out of which candidates will need to select one correct answer. SBI PO Main Objective Examination 2015 will be followed by Descriptive Examination. SBI PO Main Exam 2015 Syllabus: SBI PO Main Examination will consist of Test of Data Analysis & Interpretation (50 questions of 50 marks), Test of Reasoning (High Level: 50 questions of 50 marks), Test of English Language (Grammar, Vocabulary, Comprehension etc. : 50 questions of 50 marks), Test of General Awareness, Marketing & Computers (50 questions of 50 marks). SBI PO Main Exam 2015 Mark Scheme: Total 200 questions will be given for 200 marks. The total time duration for SBI PO Main Exam will be of 2 hour or 120 minutes. The Descriptive test will be conducted after the completion of Objective test. Candidates are required to provide answers of the questions displayed online on the computer screen through typing on the Keyboard of the computer. The descriptive examination will consist of question from English Language Test i.e. Essay on subject related to Economics. Descriptive Test of 1 hour duration with 50 marks will be a Test of English Language (Letter Writing & Essay). Descriptive Test paper of only those candidates will be evaluated who have scored qualifying marks in the Objective Tests and are placed adequately high as per total marks in objective test. 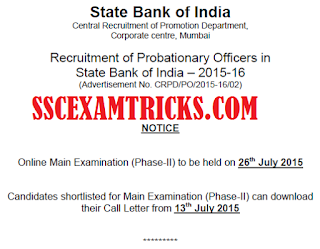 Latest news of SBI PO Main Exam Call Letter 2015: State Bank of India (SBI) has announced Phase II Main exam date on 03rd July 2015 for 2393 posts of Probationary Officer on official website www.sbi.co.in. SBI had declared that online main examination (Phase II) will be held on 26th July 2015 at various centres across the country. You can download SBI official notice from direct link given here in which release of Main Exam Admit Card date has been declared. The admit card for SBI PO Main examination (Phase II) will be available on 13th July 2015 at www.sbi.co.in. A few steps need to be followed to download SBI PO Main Examination for Phase II exam. You are required to click on direct link to download SBI PO Main exam admit card 2015 given here. Enter your registration ID and date of birth in the space given on the screen of your mobile or computer. Finally click on submit button to download your online admit card of SBI PO main examination. SBI PO Main Exam Date – 26th July 2015 (Revised from the SBI PO Exam Calender released by SBI, it was mentioned as 01st August 2015). SBI had released notification in online application had invited on 13th April 2015 against advt. no CRPD/PO/2015-16/02. The last date to apply online was on 02nd May 2015 and payment of online application fee was 02nd May 2015 for 2393 posts of Probationary Officer (PO) for year 2015-16. The Final Selection of the candidate will be merit based on the performance of online objective pre-exam, main exam, descriptive test and interview. SBI had successfully conducted pre-examination (online) on 20.06.2015, 21.06.2015, 27.06.2015 and 28.06.2015 for 2393 PO posts in various Associate Banks. SBI will release pre-exam result in 2nd week of July 2015. You need to score or marks above cut off marks in pre-exam to be called for SBI PO Main Examination 2015. The main examination will be held on 26th June 2015.